Spring appears to have arrived! 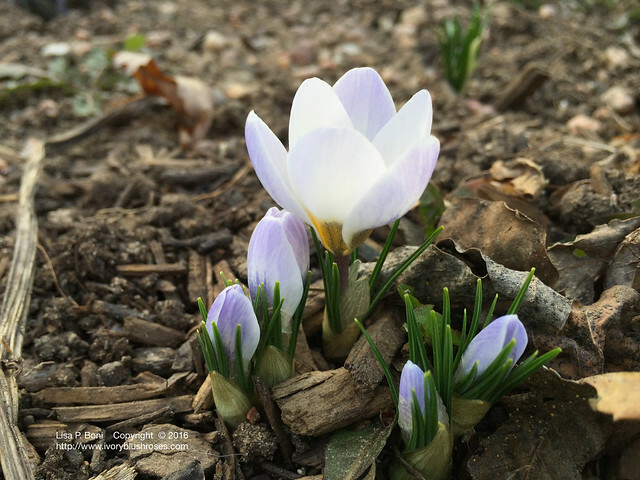 The crocus are blooming to prove it! Such beauty after the winter snows! As I sit here writing this, we also have our first spring rain, complete with a little thunder. Gladdens my heart that it is rain and not snow, though I must admit to being concerned that it is much too warm, far too early. March is usually our heaviest snow month along the front range of Colorado and so far, the temperatures and weather have been more like May instead of early March. 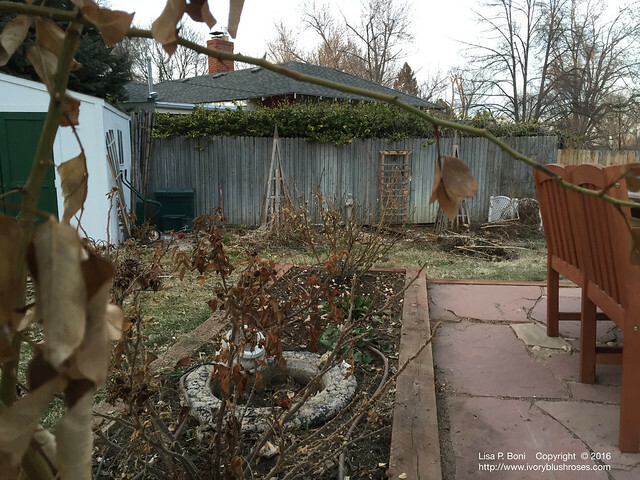 The warm temperatures and the fact that the snow, that seemed non-stop in December/January, has melted at last allowed me to get out into the yard and do some spring cleanup. So nice to get the old leaves raked up at last and begin the cleanup in the flowerbeds. Spring cleanup also involved some refrigerator clean out and in doing so, I came across two jars of my Mom's sourdough starter. It has quite a lineage and we can track its history back to the renowned naturalists, Margaret and Olaus Murie, who wrote the book, "Two in the Far North". That book was a favorite of my Mom's! 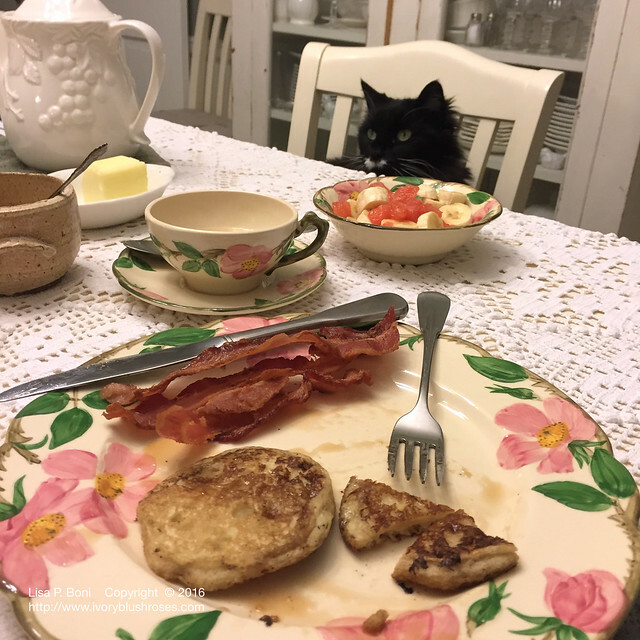 When I was growing up, we often gathered with family and friends for Sourdough Pancakes and if visitors arrived from out of state, we always had sourdough pancakes at least once during their visit! Sourdough started has the amazing capacity to survive over time and in harsh conditions. It can even be dried, then reconstituted with a little water and brought back to life. My Mom always stored hers in a jar in the refrigerator. It hadn't been used in at least 5 years, so I wasn't sure if it was still "alive" or not. But I started off by adding just a bit of warm water and flour to it and every morning and evening for a week, I repeated it. By the end of the week it was bubbling away! My daughter came over and we tried our first sourdough pancakes in years, and they turned out every bit as wonderful as I remember! Kitzy cat, my Mom's kitty that came to me when my Mom died, always used to sit at the table with my Mom and Dad for meals. I'd forgotten that until we sat down, and first thing you know, Kitzy was there too! Carrying on multiple traditions at this meal! I've been doing a lot of stitching, trying to get my CQJP 2015 project done. I needed a wee break from all that orange and yellow, so I made myself a coaster for my stitching table. Some one inch patches and lots of boro/kantha type stitching. Perfect spot for my mug of tea to sit! 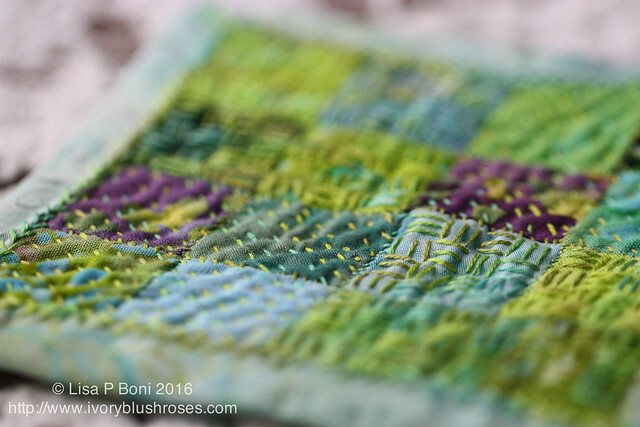 Love how tactile a piece becomes with that type of stitching! 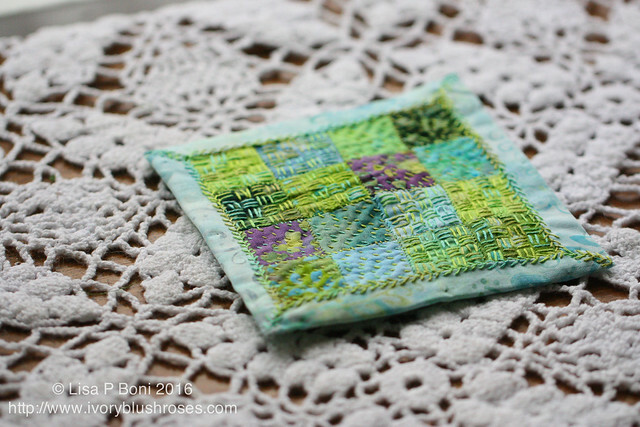 There's a new CQJP 2015 block to share, but I'll put that in a separate post! Crocus - ahhhh. Can't wait for them to bloom here - finally getting some warmer temps here so perhaps we'll soon have some in bloom too. My mother used sourdough for years and I miss the taste in tea biscuits. We're now playing with our own kefir and that adds a wonderful flavour, quite similar to sourdough. Yum! Love your flowers and mug rug. Can't wait for spring here. Hopefully you'll have no more snow and spring will burst forth early for you. Love your crocus. Your little mug rug is cute too and I just love the photo of Kitzy at the table!!!! 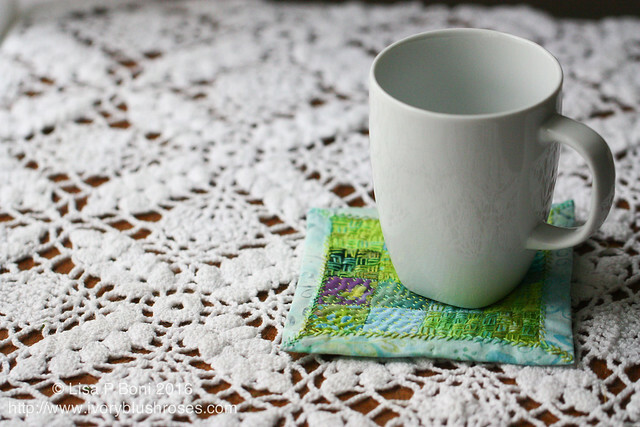 Your tea coaster square is gorgeous!